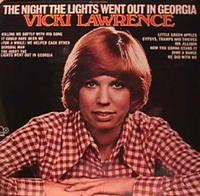 Loved story songs in the 1970s, and I also loved Vicki Lawrence, who famously got her job on "The Carol Burnett Show" because she looked so much like Carol. So of course, I loved "The Night That The Lights Went Out in Georgia." I don't know which line is better, "don't trust your soul to no backwoods southern lawyer" or "you see little sister don't miss when she aims her gun." Remember this song? What's your favorite story song of the Seventies? I was rather fond of "Run, Joey, Run" by David Geddes, the tragic story of Julie, Joey, and Julie's angry dad. Just you wait and see..."
I love that one, but also Coward of the County (k-rig! All Kenny Rogers all the time! ), Harler Valley PTA, Copacabana, Fancy & Rainmaker!! So many good ones! Story song from the 70's? "Convoy" should not be overlooked! Turn that sh** up to eleven! Loved love always will love. Why didn't Vicki get more hits? TNTLWOIG leaves too many unanswered questions. Why didn't little Sis confess and save Andy's life? Who fires a gun to flag down a cop? And what kind of friend sleeps with your old lady then tells you about it in a bar after you've been in Candletop for 2 weeks, then has the nerve to blame Seth for doing the same thing? For my money the two best 70's story-songs are Gordon Lightfoot's "The Wreck of the Edmond Fitzgerald" and Harry Chapin's "Cat's in the Cradle." I would have actually gone into my sister's piano recitals instead of sitting in the car if she had pounded out either of these classic power ballads. Helen Reddy's "Angie Baby". TNTLWOIG and that one always creeped me out, emanating tinnily from the transistor radio under my pillow in the middle of the night.